As our trip was coming to a close, we were determined to make the most of the last days of our Western Tour. From Albuquerque to Roswell to Lubbock, our day was sure to be packed full of fun! We got an early start to give us time to have breakfast at the Golden Crown Panderia per Professor Yawn’s recommendation. The boys all got coffee milkshakes, while Kaitlyn had a cup of Mexican Hot Chocolate. For our meal, we each sampled a different flavor of empanadas. 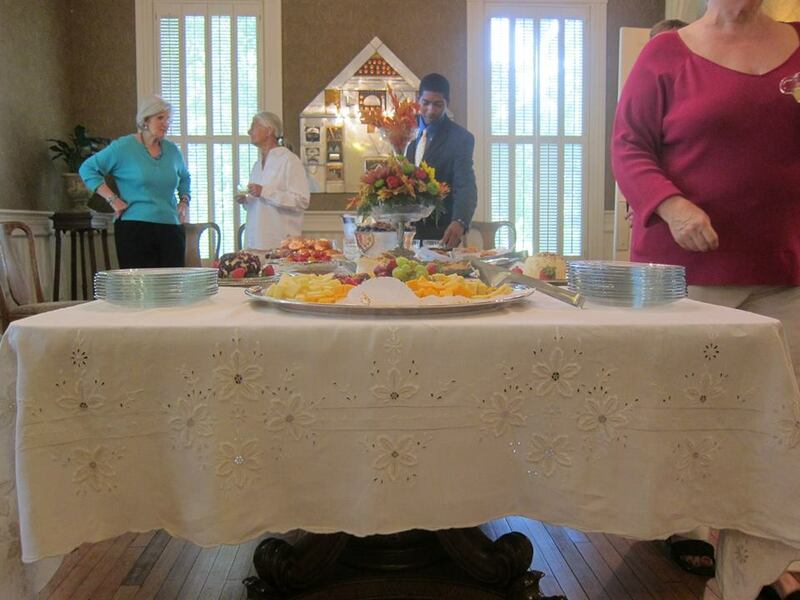 From cherry to sweet potato, we enjoyed sampling the different savory and sweet flavors. Our breakfast was a welcome change from our traditional hotel breakfast. We scouted out the sculpture garden the night before, but we were in for a couple of surprises during our visit to the Albuquerque Museum of Art and History. 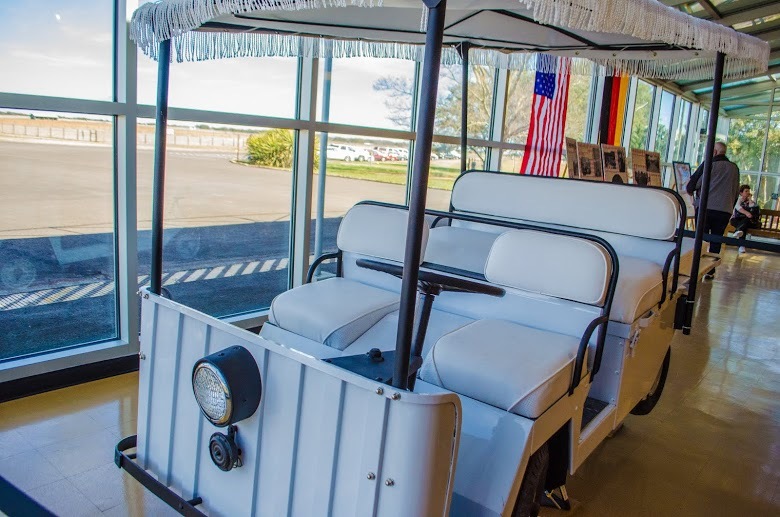 We began our tour of the museum in the traveling exhibit called “Border Crossing” which captured the lives of immigrants who crossed the border illegally. The exhibit included photography, found object art, and paintings. We were not familiar with many of the artists but we did know Luis Jimenez, a Texas native, who we have seen many times throughout this trip. He had an art piece named El Buen Pastor (The Good Shepherd) and his description told a sad story about an immigrant boy killed near the border. Our next exhibit was more or less contemporary and included some local names such as Raymond Johnson, Allan Houser, and Peter Hurd. As we made our way to the end of the exhibit we discovered a beautiful cross by Georgia O’Keeffe! 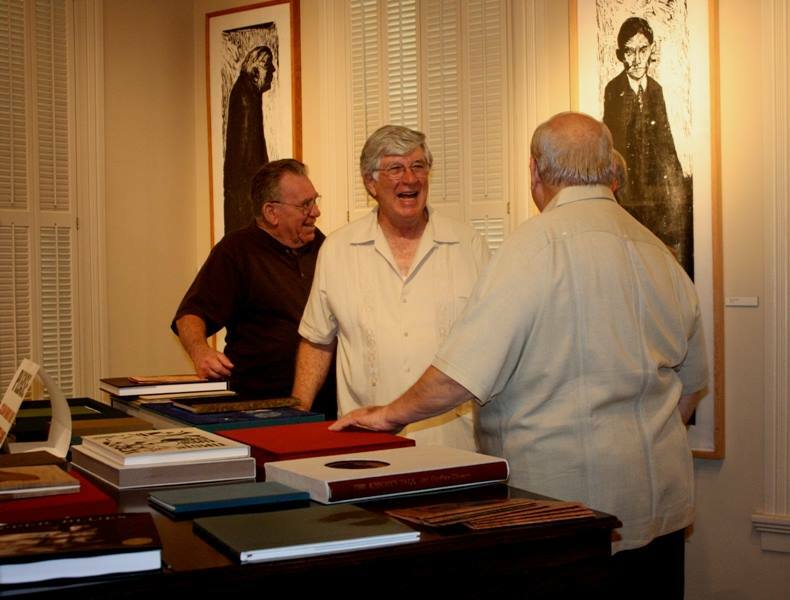 The third exhibit was “Art and Politics” which included political cartoons, an Andy Warhol, and photographs from political events. 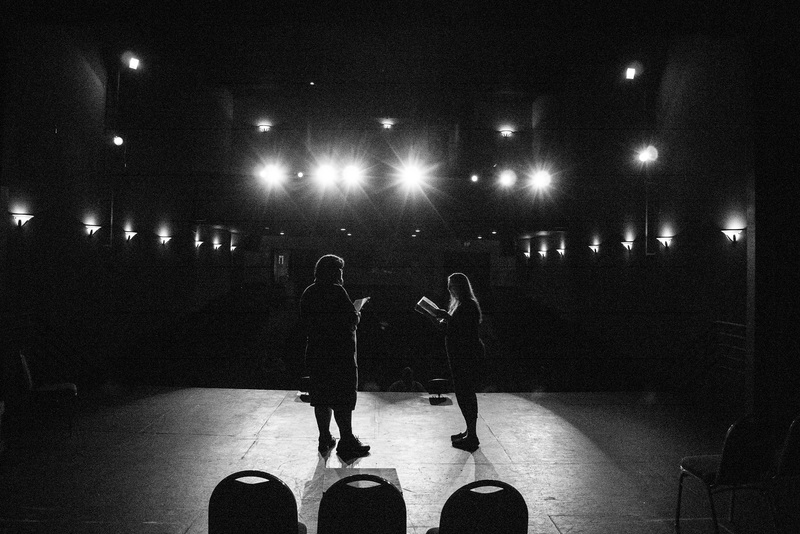 It was interesting for us because of our majors and our love for the arts. After looking through the exhibit we headed outside for a day time tour of the sculpture garden. We saw pieces by Luis Jimenez, Jesus Moroles, Allan Houser and Glenna Goodacre. Overall the museum was a great addition to our trip! Unfortunately, Ryan had to fly back to Houston to get ready to go back to school at the University of Arkansas. While Professor Yawn took Ryan to the airport, we walked through the shops and streets of Old Town Albuquerque. The little shops were filled with Native American homemade goods, clothing, and trinkets. Our favorite shop was the local artist co-op. Professor Yawn joined us and we browsed around finding unique gifts and souvenirs. Once we finished shopping we had to hurry back to our hotel afterwards to grab our bags and head to Roswell for the afternoon. The Roswell Museum of Art was a new experience for our entire group so we did not know what to expect. By the end of our visit we were pleasantly surprised! The Roswell Museum of Art had their RAiR at 50 exhibit up which showcased 50 years of the Roswell’s Art in Residency Program. The artwork ranged from paintings to sculptures and even a pinball machine! 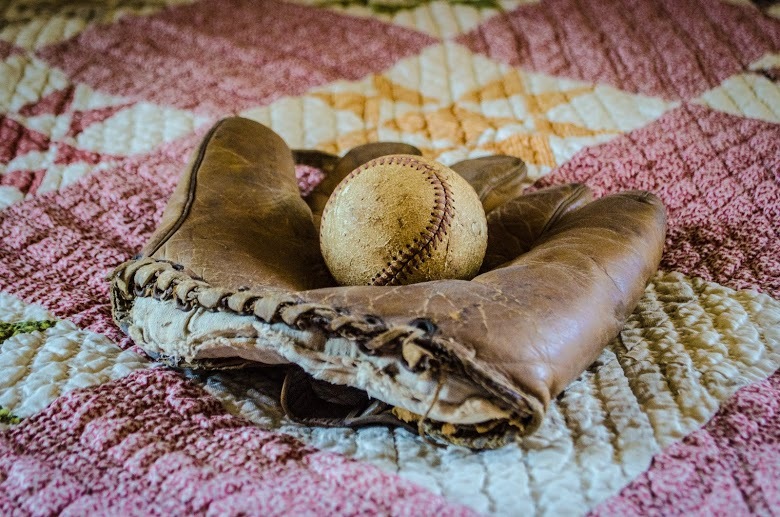 One of my favorite pieces of art from the museum was Chavez Ravine V by: Clinton Adams. The piece had a strong emphasis on geometric shapes and told a story about the immigrant community harmed by the development of the Los Angeles Dodgers Stadium where their neighborhood was. We didn’t recognize many of the artists, but we did recognize some well-known artists such as Elmer Schooley and Peter Hurd! Elmer Schooley was a new artist for us during the trip, but we all grew to enjoy his art work! Known for repeating patterns, we were able to recognize his works at the Roswell Museum and we found it interesting that he was actually a resident of Roswell’s program. 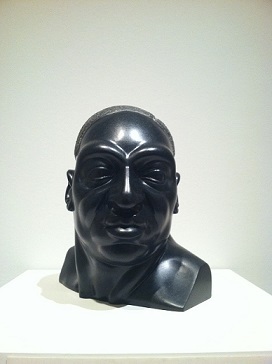 …and we also visited his sculptures. Well known to the LEAP Ambassadors, we love his use of color and Jimenez’s unique style. Our visit to the Roswell Art Museum was short, but we wanted to visit Roswell’s most famous museum during our brief visit also. We drove a half mile before finding ourselves at the International UFO Museum and Research Center. The story goes that in July, 1947, a family of farmers near Roswell, New Mexico, were witnesses to a mysterious aircraft crash landing near their home. This spooky occurrence sent the nation to a science-fiction whirlwind after rumors spread that what landed that summer evening was an extraterrestrial spaceship. More than fifty years after the incident, the LEAP Ambassadors decided to make our on conclusions on the Roswell UFO landing by visiting the International UFO Museum and Research Center. As with the rest of the town, the façade of the building is riddled with alien motifs, adorned with alien statues, cutouts, posters, and the like. 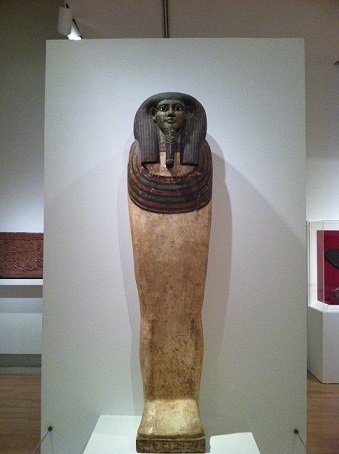 However, this fascination with otherworldly creatures was manifested with increased intensity inside the museum. Inside, every inch of wall is dedicated to retelling and interpreting the alleged Roswell UFO incident of July 1947. Witness accounts of extraterrestrial beings lying still in the ground amongst metallic debris are posted throughout the museum. Furthermore, reports that present supposed evidence that the vessel that was recovered that summer was not from this world are also presented to the visitors of the center. But if transcripts of police reports are enough to properly imagine the beings that were seen falling that day, the museum also offers a possible depiction of what the vessel and its crew looked like. Accordingly, we decided to photograph ourselves in front of this artistic rendition of events to make sure to not forget this Roswellian legend. What we found the most intriguing in the museum was not the cast of the alleged alien mandible, nor was it the aluminum scraps that were recovered from the crash, it was the interpretation of ancient civilization’s “encounters with extraterrestrials.” Among the most notable was a Mayan petroglyph that UFO researchers consider evidence that this South American tribe had access to alien space crafts. They offer explanations to the various etchings in the stone. These vary from carvings that represent the brakes and throttles of the space ship, to the “comfortable head rest” of the craft. This is only one example of the evidence presented by the museum that proves that humans have been in contact with aliens. However, this proof is abundant within the walls of the International UFO Museum and Research Center. There is so much proof, that we could not go through it all with the required scrutiny it required since we had limited time in the museum. As we exited the building, we could not resist to take a quick photo with our newest green friends from outer space. 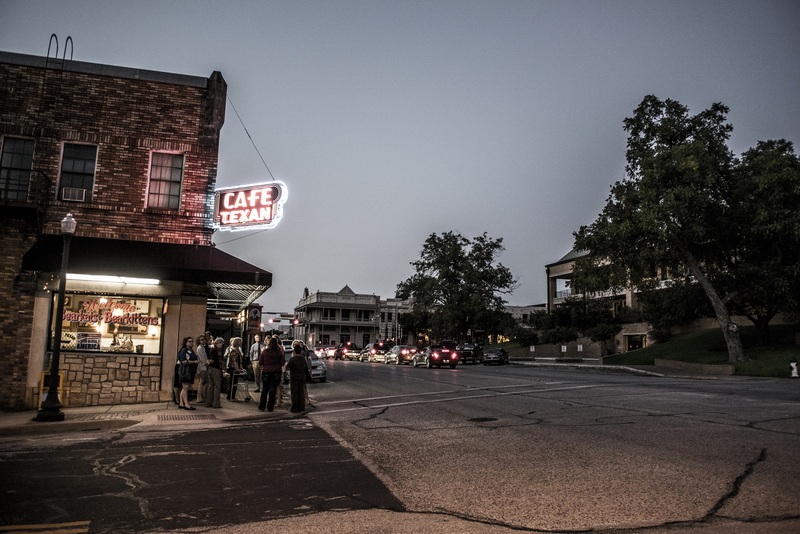 Knowing a little bit more about extraterrestrial history and its relationship with Roswell, we left town and headed back to Texas (hopeful that no mysterious light would send us into space of course). So from there, we drove eastward, toward home, ending the night in Lubbock ready for some sleep and our last day of exploration. Mr. James Reston had a busy day planned at SHSU. With back to back events scheduled for the day, the LEAP Ambassadors were prepared to help Mr. Reston provide meaningful insight on his latest book “A Rift on Earth.” The book talks about the famous Vietnam Veterans Memorial Wall located in Washington, D.C. and its controversial history. Mr. Reston had the opportunity to speak about the Wall to Dr. Melissa Mednicov’s class, where the students proved interested in knowing more about the Vietnam Era and about how the memorial got started. Afterwards, students were able to ask questions and were lucky enough to receive signed books by Mr. Reston. We were thrilled to have shared this experience with the art department but our day was by no means over. Following James Reston’s busy morning, we met for lunch at one of the LEAP Center’s favorite local restaurants, Carbonero Rotisserie. We did not have to go far to give our guests the opportunity to try a different cultural cuisine, authentic Salvadorian food! Joining us was former Mayor of Huntsville, Mac Woodward, and the News Director of KSAM, Larry Crippen. We all began by sampling El Salvador’s most notable dish, pupusas, as well as, some sweet fried plantains. As lunch continued, a myriad of conversations resonated across the room. One of the most interesting discussions was about the famous Watergate scandal and James Reston’s role in helping journalist, David Frost, prepare the televised interviews with Richard Nixon. Mr. Reston also gave us an overview of his unpublished book addressing the tragedy of 9/11, which we are looking forward to seeing in the bookstore shelves. With the great company and the great food, time flew by, and finally it was time to head on to Houston. Although traveling to Houston can be a bit of a drive, especially during rush hour traffic, the LEAP Ambassadors eagerly traveled to Brazos Bookstore in Houston for Mr. Reston’s book signing. Thankfully our drive down was uneventful and we had a few minutes to browse Brazos’ unique collection of books before the talk began. A Rift in the Earth: Art, Memory, and the Fight for a Vietnam War Memorial was published only a month ago. The book discusses the process of creating the Vietnam War Memorial, the submission contest, the controversy around the design of the Memorial, as well as the art and architecture behind the Memorial. The LEAP Ambassadors were eager to learn from Mr. Reston about such an important piece of our nation’s history. Interestingly, the architect that won the submission contest, Maya Lin, was a twenty-one-year-old undergraduate student at Yale. Mr. Reston spoke highly of Ms. Lin and of her courage throughout the vetting process of the Memorial. His book details the controversy behind not only the design of the Vietnam Memorial, but also the Memorial itself. The War created divisiveness in the United States and the Memorial starting what Mr. Reston calls the “Second Vietnam War”. Some did not think the United States should memorialize a lost war and such a horrible blemish of American history, while others wanted to acknowledge the ultimate sacrifice of the 58,000 Americans who gave their lives in service. Mr. Reston’s description of the Memorial throughout the book provided vivid imagery to the reader. He explained some of the hidden symbolism of the art like the reflective quality of the black granite which allows the Memorial visitor to imagine themselves in the place of the names on the wall through its reflective nature. The audience truly felt the importance and impact of the Memorial through his words. Ultimately, the Vietnam War Memorial stands as a symbol of unity today; unity in a time of divisiveness and turmoil in the country. The Memorial reminds us not only of the lives lost fighting this specific war, but in all wars. The names inscribed in black granite remind of us the toll war takes on a country, and serves as a poignant reminder of the tragedy Americans endured. Although Mr. Reston’s book is a reminder of the tragedies of war, it also gives the reader a sense of pride with the emergence of the Memorial. Mr. Reston concluded the book talk by visiting with the audience and signing guest’s books before we departed off to dinner. With a very successful book signing finished, we thought it was time to have some dinner making the short drive to Azuma Sushi and Robata Bar. As we have visited this place before, it has now become a LEAP favorite and we wanted to show Mr. Reston the delights of this sushi restaurant. As always, we ordered a little bit of everything. Ranging from raw sushi for the curious, some fried sushi for those who did not appreciate the raw sushi, and kabobs for everyone to enjoy. Regardless of which group you were in, the Crazy Irishman Roll was the favorite. This yummy roll of salmon, tuna, and avocado wrapped warmly together by green soybean paper, flash fried, and then covered by spicy mayo, unagi sauce, green onions, and masago was a mouth-watering joy to feast on. But if one amazing culinary experience wasn’t enough, the grand finale was dessert time. Not knowing what to expect, we were intrigued by the dessert options that they had. Tempura banana with ice cream, fried red bean ice cream, and Mochi (a confection made with pounded sticky rice and stuffed with an ice cream filling). It was with a sigh of satisfaction that we moved away our empty plates and continued our chatter about the day’s successes. With a busy week still ahead of us, we appreciated this moment to relax and enjoy our conversations with Mr. Reston. With the day winding down, we decided that the sunset and cooler weather would be a perfect setting for us to visit Smither Park. Designed by Huntsville-based builder Dan Phillips, the park consists of a concrete enclosure decorated with the quirky creativity of multiple local artists. Upon arrival, we instantly noticed how extraordinary this park was, but it was not until we got closer did we realize all the treasures within the wall’s artwork. The first thing we noticed was a large amphitheater in the shape of a fish with its open mouth as the performance area. The inside of the fish was made mostly out of traffic signs and automobile parts. From there, we followed a dolphin-decorated pathway to the sections of the enclosure. Each section had a different theme with its own unique treasures to be appreciated. The various panels were made with an abundance of media, kitchen appliances, glass, keys, rocks, toys, and nail polish bottles and everything in between. We were amazed to see how certain animals or designs were created by using everyday materials. The overwhelming theme of the park was the ocean. From the walkway depicting dolphins, birds, crabs, sharks, and boats, to the panels arranged to resemble an octopus or fish, and a bench with a mermaid colorfully pieced together. We took pleasure in finding the hidden artwork and sharing with each other these discoveries. 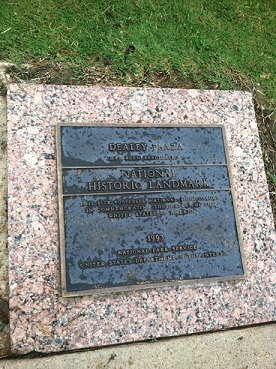 Of course, among the beautifully constructed park, we were able to find a piece of Sam Houston State University. A few Class of 2013 graduation pins were among the miscellaneous objects added to the park. While most of the artwork was very colorful and vibrant, there was a particular section that was just one color, white. Because of the contrast, it made this panel stand out from the rest. Professor Mike Yawn expressed this panel as being his favorite because it had the most whole, unbroken pieces of ceramic within it. As we walked through the park we saw many sections of the wall incomplete. We were excited about how beautiful the sections will become once completed and are considering clues to develop a scavenger hunt much like the one we completed earlier in the day. A few of us had the honor of being crowned the queen of the tigers. Others took a break to go kayaking. We concluded our visit to Smither Park by relaxing on the bench swings before it was time to head to dinner. Smither Park was commissioned by Stephanie Smither in honor of her late husband, John H. Smither. 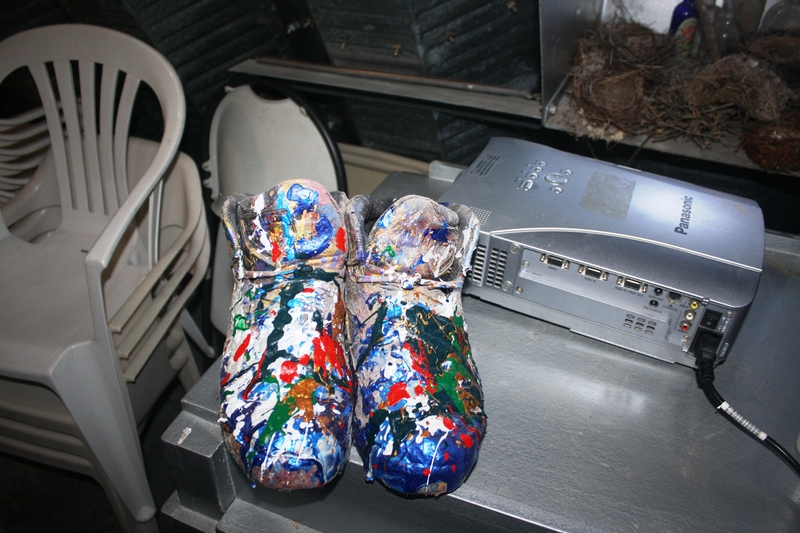 The project was part of the Orange Show Center for Visionary Art. Living close to one of the largest cities in the US, it is always tempting to visit the hustle and bustle of Houston. 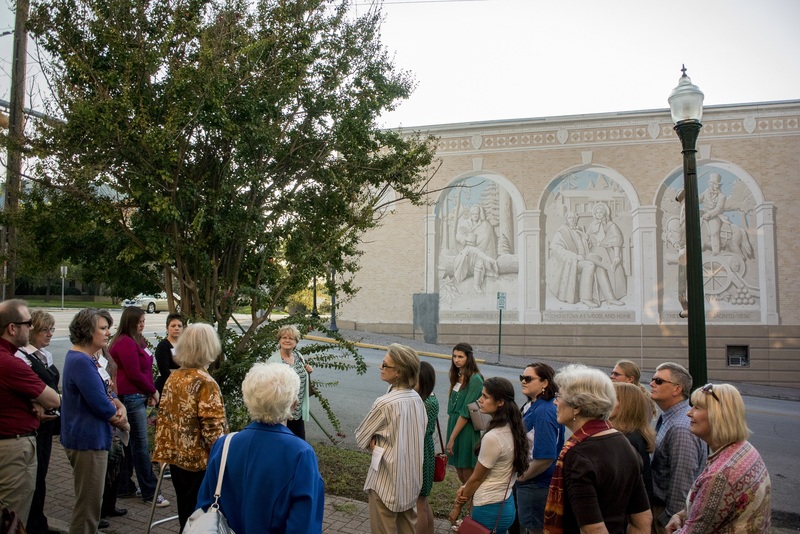 With 375 developed parks under the City of Houston Parks Department and an established art community in the city, the LEAP Ambassadors planned a weekend itinerary full of parks and art museums. To kick off our weekend, we gathered old and new friends to join us in our visit to of one of Houston’s newest marvels. In the dark, mysterious cavern, a group of around 30 people waited in anticipation for one of Houston’s most unique art performances. The LEAP Ambassadors were meeting other SHSU alumni that had previously been either a LEAP Ambassador or Junior Fellow at the Buffalo Bayou Park Cistern. As special guests, Mark Burns and Betty Moody accompanied us throughout this expedition. The Cistern is an 87,500-square foot underground reservoir much in resemblance to the ancient Roman cisterns in Istanbul. This city reservoir was constructed in 1926 to provide fire suppression and store drinking water. In 2007, it was put out of commission when it sprang a leak that was never located or contained. Three years later, this historical landsite was about to be demolished. However, around that same time, the Buffalo Bayou Park Partnership was working on the Buffalo Bayou Park project when they happened to discover the cistern. They acquired a $1.2 million grant from the Brown Foundation to remodel the space and repurpose it for art installations. Which is exactly what Venezuelan artists Magdalena Fernandez used it for. With its 18-inches of water and its 221-25ft tall columns, this imposing structure was the perfect medium for the art installment that Fernandez had in mind. With the help of the a-cappella Slovenian choir, Perpetuum Jazzile, she orchestrated an installation that appeals to sight and sound alike. With snaps, hand slaps, stomps, and drumming, the Perpetuum Jazzile were able to emulate the sound of rain. With the accompaniment of a light show that danced across the stern columns, she created a space that emanated the sense of being in the middle of a rain storm. Thunder and lightning struck, as well as wonder and amazement while in the cistern. With old and new friends to enjoy it with, Rain -as the installation is appropriately titled- was a wondrous experience. 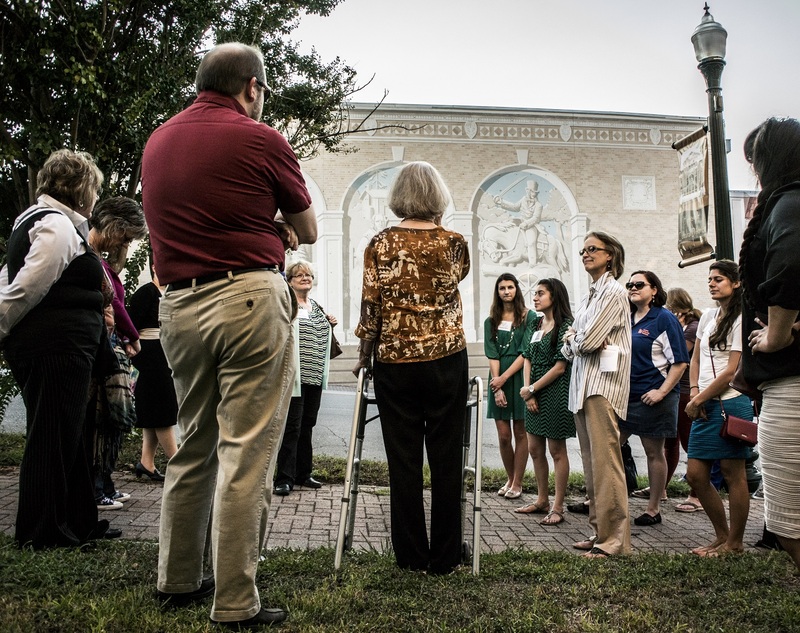 The Cistern, located just outside of downtown Houston, also served as a wonderful spot for a reunion photograph! Following our tour of the Buffalo Bayou Park Cistern, our group met at Black Walnut Café. There, past and present Ambassadors visited with each other while specials guest Betty Moody joined the reunion. Sampling a number of meals such as the Doc Krazy turkey burger, a french dip sandwich, and the spicy jalapeno chicken pasta, we enjoyed the meal almost as much as the pleasant conversation. Before the evening ended, LEAP Ambassadors thanked our graduating members- Alex, Megan, and Jessica- with well wishes and gifts. Megan, Alex, and Jessica will all be heading to different law schools in the fall. Additionally, we made sure to thank Ryan Brim, who graduated high school this semester and will pursue an engineering degree at the University of Arkansas. Most amusing from this gift giving, was Ryan’s college-prep present. It consisted of a shower caddy with travel sized shampoos and soaps. Participating in ten years of LEAP events and trips, for the past few years he has used our hotel lodgings to save on toiletry expenses by collecting shampoos and soaps. A peculiar habit indeed, it is certain that Ryan would rather not have his secret revealed in such a public setting. Dinner continued with a myriad of conversion. From table to table, alumni shared advise with current students, a dedicated art gallery owner shared her work experience with engaged listeners, while other students mingled with each other on future job opportunities. Enclosed in the room was the resonant sound of joyful conversation that could only come from friends happy to se each other. As conversation receded, the evening ended as alumni and guests headed home. For the LEAP Ambassadors, we were thankful for our visit with friends and headed to our hotel to prepare for the rest of our Houston Arts and Parks Tour. 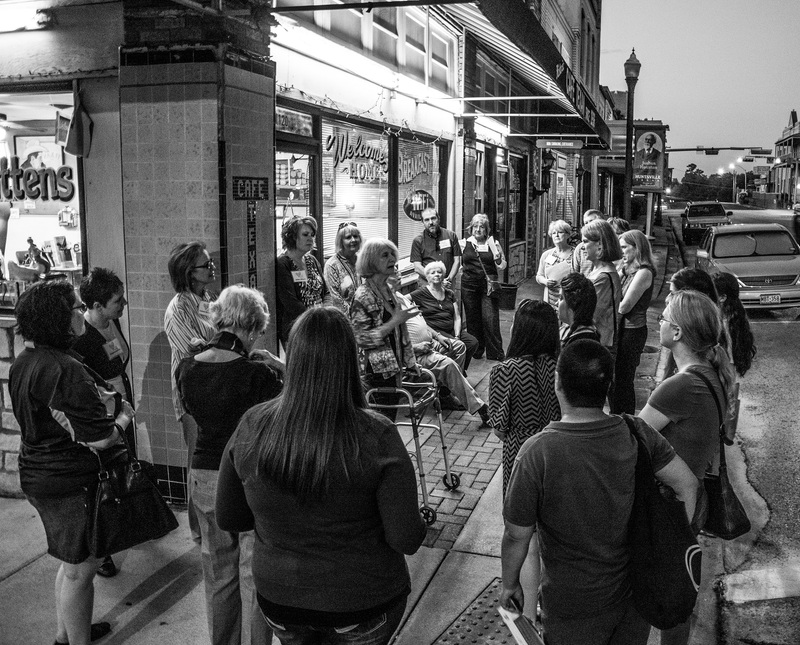 For the third week of heART of Huntsville, participants were taken to Huntsville’s historic downtown to see parks, art, and fine arts at multiple locations, followed by a fine dinner at Carboneras. Leading this tour was Linda Pease, the city’s long-standing public art authority. 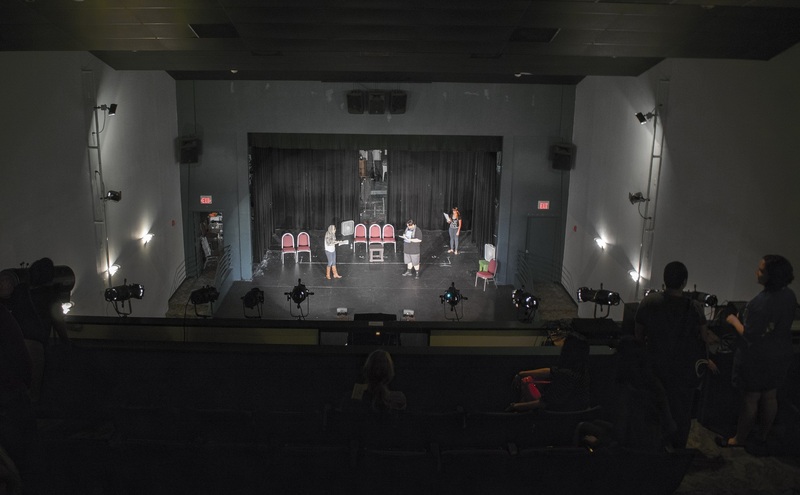 Pease isn’t an artist, but she has been behind much of the beautification of the community for the past forty years or so, and she offered an oral history of Huntsville’s art scene. The tour began at Founders Park, on the southeast corner of 10th and University. 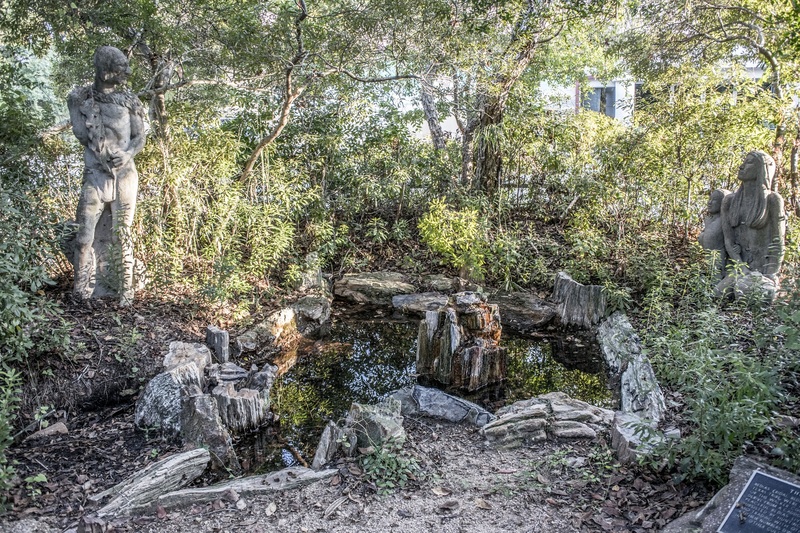 This small park was created in the late 1980s at the springs that served as a meeting place between Huntsville’s founding father, Pleasant Gray, and the Bedias Indians. From the spring sprung Huntsville, as more settlers settled, business thrived, and civilization eventually flowered. The site recreates the springs with a small, shallow pond, and artists Monica Taylor and Larry Zink created statues of Indians at the site. Taylor and Zink also contributed to the downtown area by assisting Richard Haas with his revitalization of the downtown square. Haas, an artist, informal architect, and unofficial “urban planner,” created 14 art works in the downtown area in the 1990s. 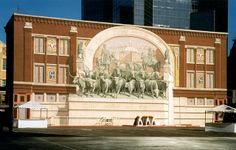 Perhaps the finest of these artworks is the three-part mural of Sam Houston on the east side of the Smither Building on University Avenue and 11th Street. This mural depicts Sam Houston in battle, with the Indians, and as gentleman of Huntsville, Texas. Other key works include the faux Roman ruins, the mural of Leadbelly on Sam Houston Avenue, and the movie posters on the front of the Old Town Theater. 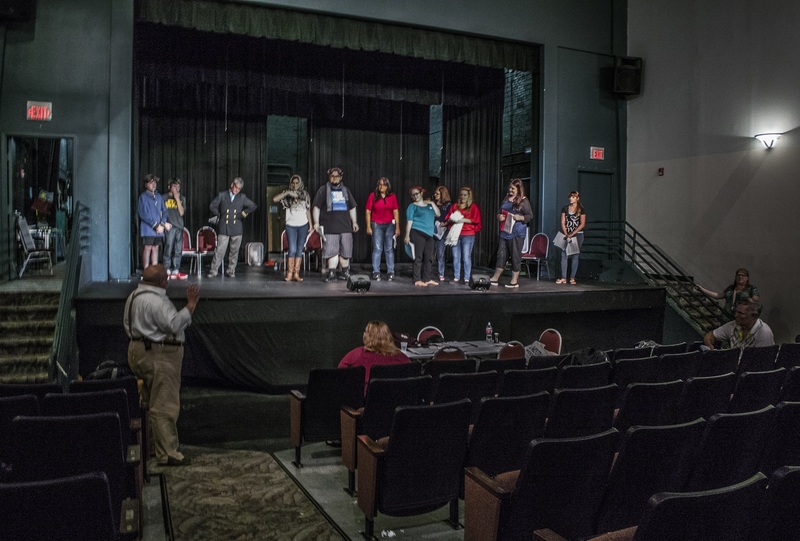 Bruce Chabot, a professor at SHSU’s English Department, is the director of the play, and the production crew graciously provided some comped tickets to members of the first-ever heART of Huntsville cohort. Another downtown treat is the Art Department’s “Satellite Gallery” at 1204 University Avenue. Here, art students and art alumni display their work for the public. 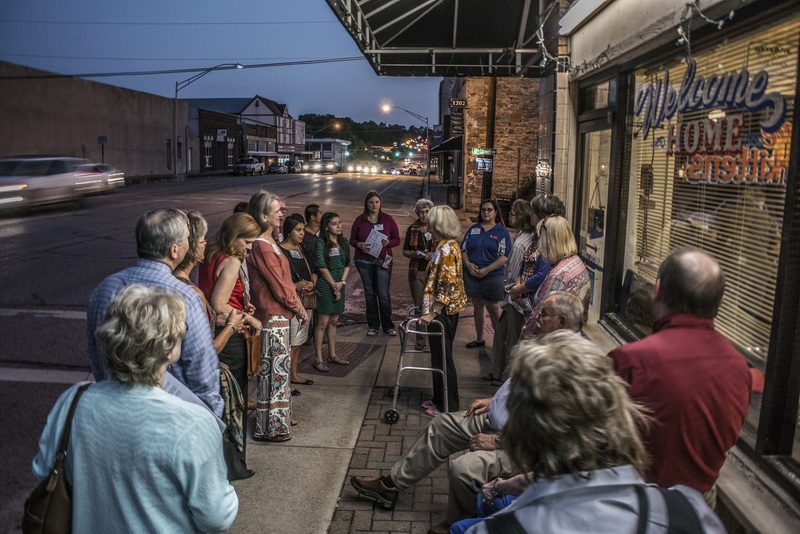 Following a quick tour of this gallery, the group headed to the historic Cafe Texan, where Linda Pease shared more information about Richard Haas…. …and discussing many of the other Haas detailing around the square. 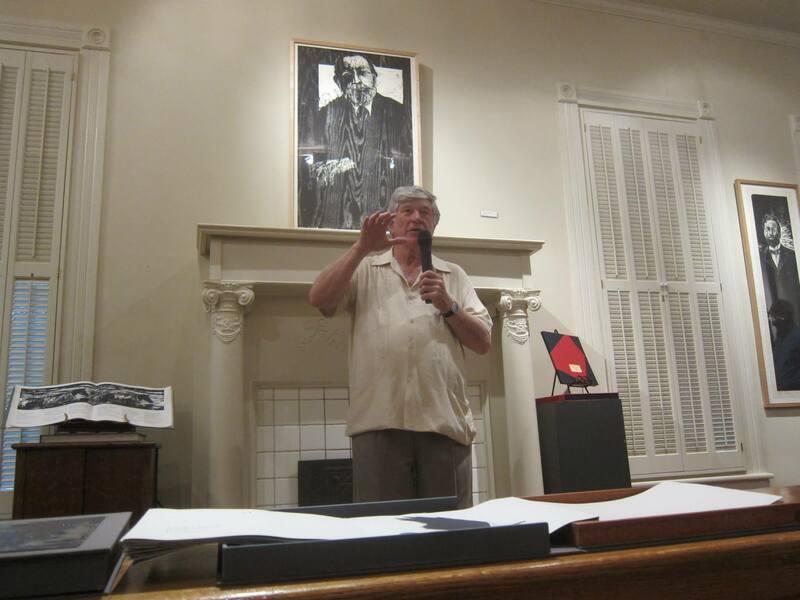 Interestingly, however, the largest concentration of his works is in Huntsville, Texas. With help from the LEAP Center, Art Department, and the Huntsville Public Library, Richard Haas will be in town November 19th, 2015. He’ll deliver remarks on campus and at the Huntsville Public Library, where he has donated the studies for his Huntsville murals. Jones, who is an SHSU alum, was on hand to deliver remarks describing his career and his work. Stanley Lea was also featured at the opening. 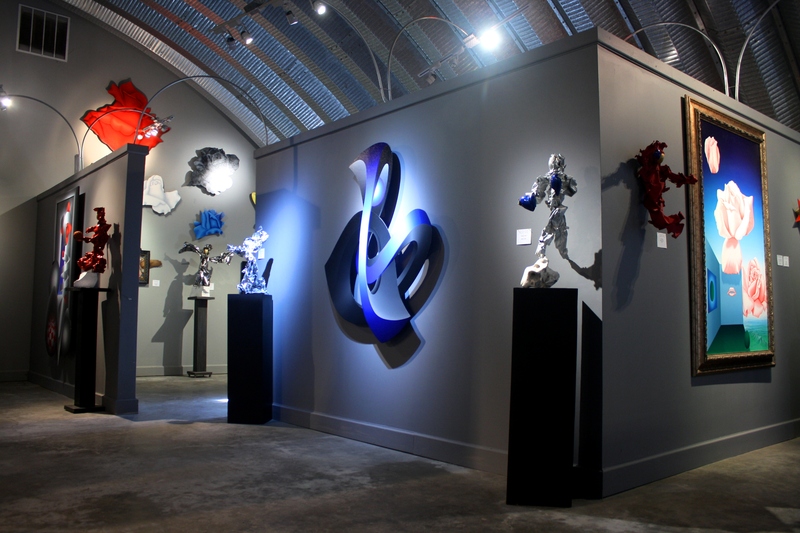 Lea’s works are featured in the sales gallery and include works that date back to the 1970s. 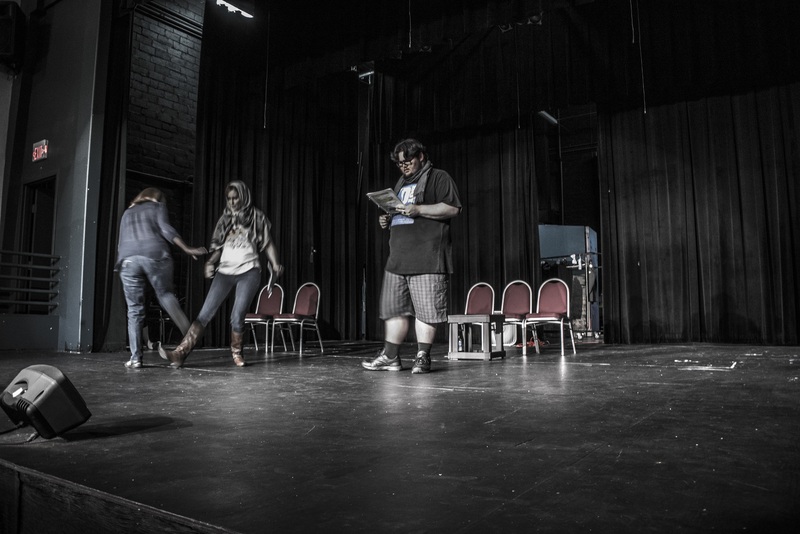 Lea’s works can be found in museums across the United States (including the Smithsonian) and many SHSU students and faculty have seen the works in the Gaertner Performing Arts Center. 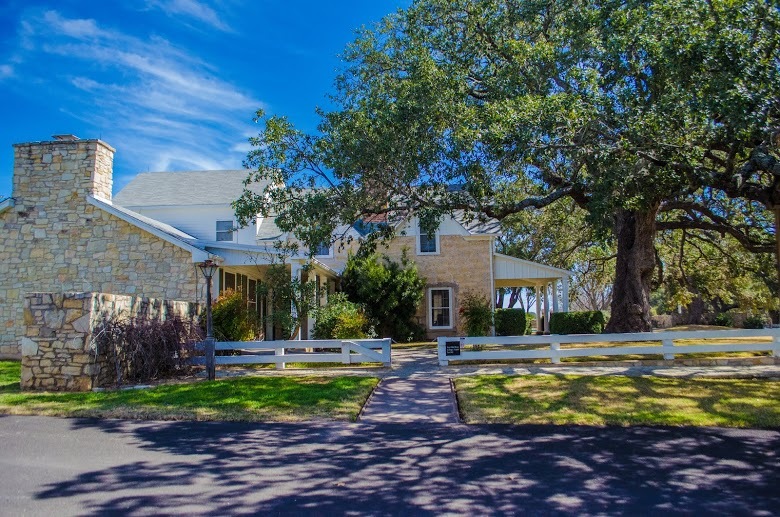 The Wynne Home Arts Center promotes arts in Huntsville, Texas and in East Texas, showcasing four major exhibits each year in the Lela Mae Brown Gallery, work from local artists in the Sales Gallery, and provides 40-45 art classes annually. 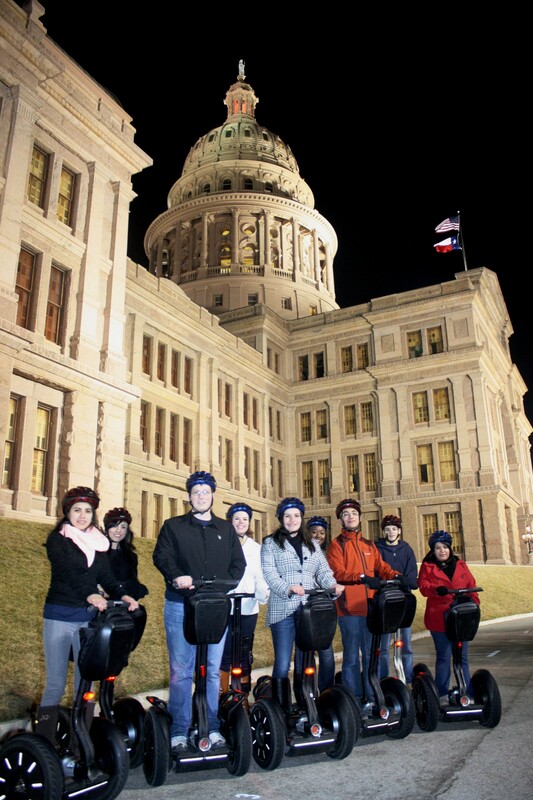 The LEAP Center at Sam Houston State University promotes Law, Engagement, And Politics. As part of the Center’s engagement function, students volunteer for government agencies, non-profit organizations, and other worthy causes. Nancy Gaertner from the Friends of the Wynne led the volunteer event, with five students from the LEAP Center assisting.